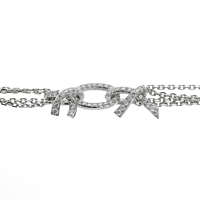 Few pieces can compare to this extravagant 18k white gold Chanel necklace. 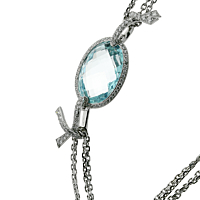 An awe-inspiring collection of precious stones has been set throughout this necklace, including 262 diamonds (4.42ct total), 12 smaller aquamarine stones (13.9ct total), and 1 extra large aquamarine (22ct) which is the focal point. Beautiful akoya pearls also dangle beneath the pompon in the perfect visual counterpoint to the soft aquamarine and white gold tones.